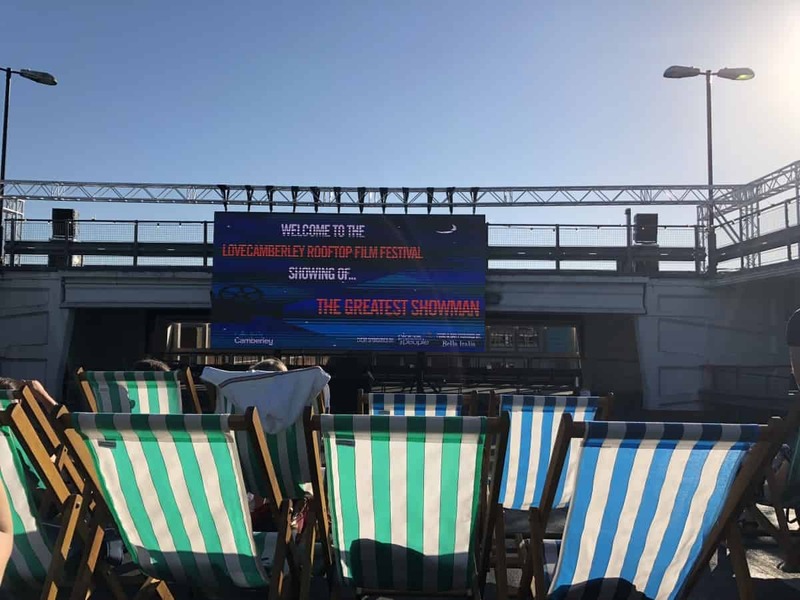 Last week Dave and I went to Camberley’s Rooftop Film Festival for the first time although it’s been an annual event in the town for the last few years. Dave booked it because he knew I really wanted to see The Greatest Showman and although it was already available to buy we just hadn’t had a chance to see it – so this was a great opportunity and a really different evening out too. 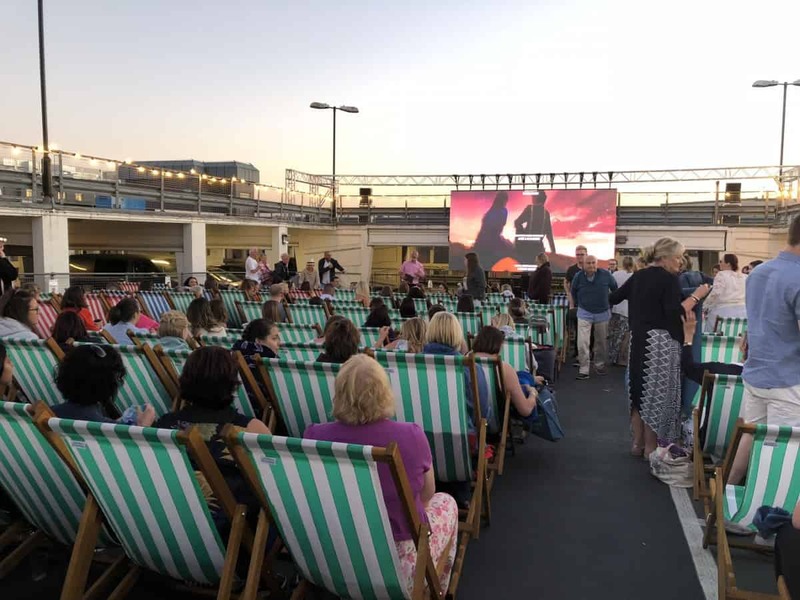 Camberley’s Rooftop Cinema is set on the top of the Main Square Car Park, with the roof closed to cars and instead set up as a really good sized event space. 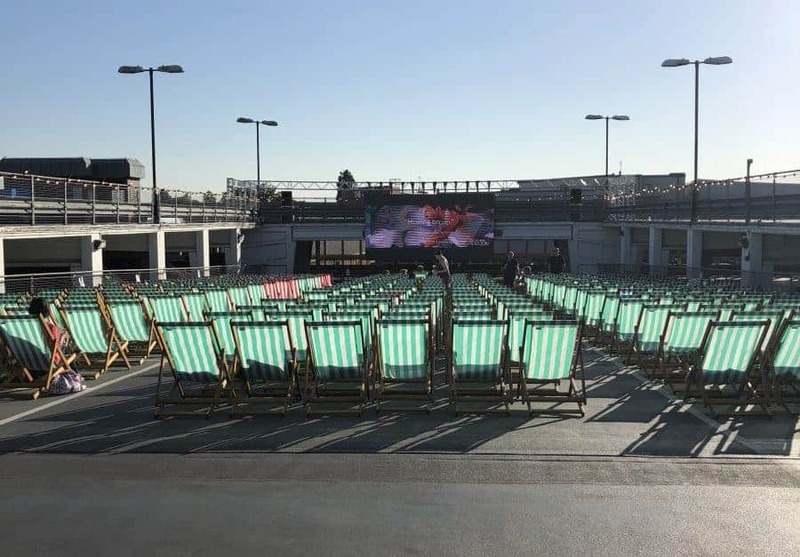 The screening is set up with deckchairs to sit on and they are arranged on the downward slope of the car park making sure that everyone has a great view of the screen. 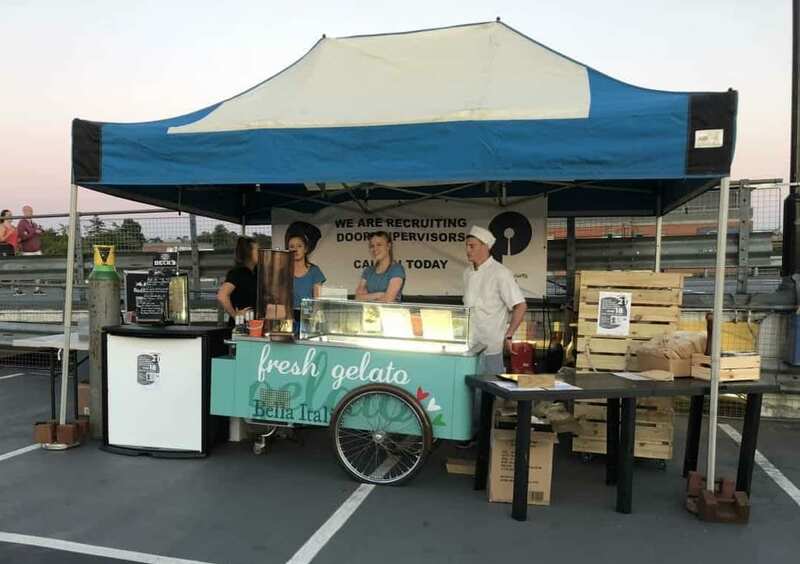 As well as the movie there was also a Bella Italia stand serving really reasonably priced food and drinks – pasta dishes for £6 each, a G&T for £4, a pint for £4.50 etc. As doors opened at 6:30pm and the movie started at 8pm this was great to have to enjoy before the movie – although Dave and I packed a picnic. The venue were really relaxed about taking in your own food and drinks as long as you didn’t bring any alcohol with you – and the whole event was for people aged 18 and over regardless of the movie classification. When the movie started quite a few people carried on talking but this did die down fairly quickly and watching the movie whilst the sun set was pretty magical. There are definitely worse ways to spend an evening. Once the sun had gone down it did get quite chilly – despite it being a warm summer evening, due to us being so high up, so I’m glad I took a blanket with us. I would definitely recommend taking a blanket or jumper whatever the weather just to make you as comfortable as possible. 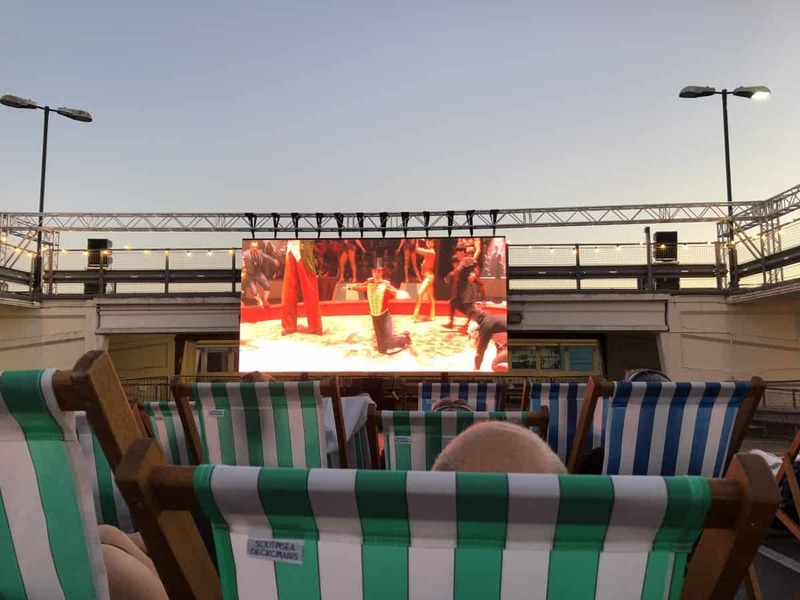 Camberley’s Rooftop Cinema was such a nice evening and throughout the movie the audience were so involved in the story – with clapping, cheering and a round of applause at the end. It is probably one of the most positive movie experiences I have ever had and I am already looking forward to next year. 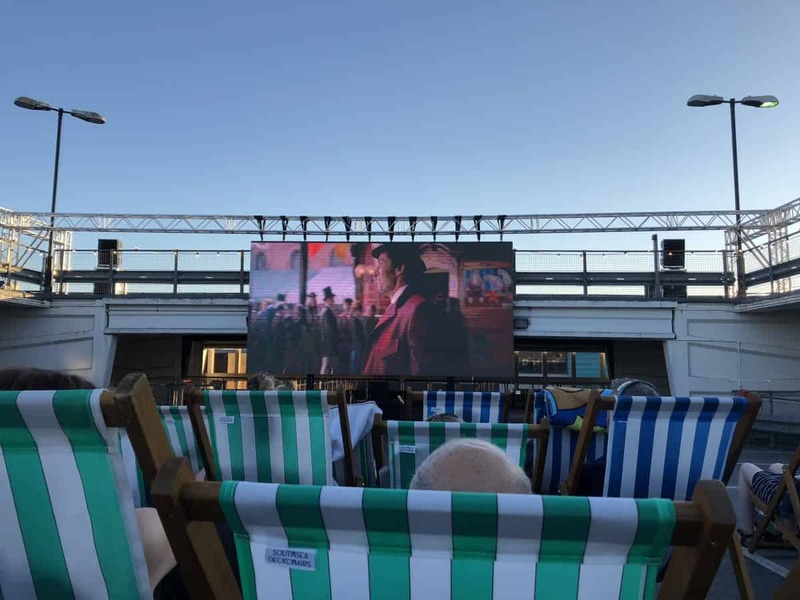 Tickets to Camberley’s Rooftop Cinema were £12.50 each with no extra booking fee to pay which I think is fantastic value for a really nice evening out. Plus, The Greatest Showman was such a fantastic movie that it made the whole experience even better. Disclosure: We paid for the above tickets but enjoyed the experience so much we thought we’d tell you about it.